Optoma NuForce BE Free8 review | What Hi-Fi? As the market for true wireless in-ears becomes more and more saturated, the technology alone is no longer enough to make a product stand out. Some of the more recent models vying for your attention are so conspicuous you may as well have a couple of daffodils hanging out of your ears. Not so when it comes to Optoma’s BE Free8s. They’re as slight as we’ve come across and almost exclusively black (there's a small 'NuForce' logo on their undercarriage and a slim line LED indicator), limiting ornamentation to a few ribs on the outfacing section of the chassis. 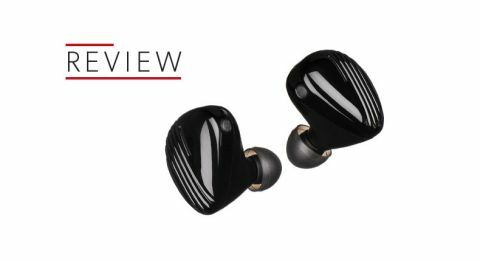 The BE Free8 also boast among the best cumulative battery life of any true wireless in-ears we’ve tested. These Optomas offer up to four hours on a single charge, with a further three full charges harnessed within the case before you need to plug it back in. This long battery life will no doubt be enticing to one area of the market Optoma seems keen to make its core audience: listeners who exercise. These active types will benefit from a marathon’s-length of playback, enjoying the BE Free8s’ lightweight structure and waterproof qualities as they do so. The in-built mic, which works with Siri and Google Assistant, means your running friends will also be able to interrupt your concentration to tell you how far they’ve just run. All in all it's a really sensible package, which is just about the highest praise we can lavish upon the design of a product like this. They’re easy to use, too, with the near-standard multi-use buttons for play/pause, track skipping and mic. And there are no issues with pairing - we're connected within moments. The first thing we ought to mention when it comes to the BE Free8s’ delivery, though, is they’re quite noisy. It’s only discernable when there’s no music playing, and even then not so much when you’re out and about, but it doesn't help minimise some of the other characteristics we hear in the performance. When we get to some music, in this case Bonobo’s Migration, in many ways it’s quite pleasant. The balance is decent, devoid of really flabby bass or rough edges. And while the Free8s aren't overly analytical, they are detailed enough - there’s enough body to anchor the mix effectively. What lets the Optomas down is not unlike flaws we’ve found with many of the true wireless in-ears we’ve tested. Namely: loose rhythm management and disappointing dynamics. There’s little expression in the piano lines of the Bonobo track, nor intensity to the live percussion. The pulsing, programmed introduction doesn’t time as regimentally as we know it should. Tracks with live vocal – Break Apart, Surface or No Reason, for example – really highlight a lack of dynamic versatility. The Free8s stop short of being outrigh boring, but they certainly lack any notable expression. Overall, it’s a fairly flat delivery. We expect more for our £200. Consider the Award-winning Sony WF-1000X in-ears. They do everything the Optomas do, but better - and with noise-cancelling thrown in - for the same price. They offer far better value, and make the Free8s seem like they're dragging their heels. Still, there could be a home for these Optoma in-ears among those who simply want a reliable, pretty much purpose-built pair of wireless headphones to soundtrack their cycle, run or gym session. As long as these lively folks don’t expect the Optomas to hold their own in sonic terms.